What does Pub-Me CMS support in the framework of the basic installation? Perhaps you’ll be surprised how much stuff there is and many functions, elsewhere charged extra, are included in the very core (e.g. galleries, registrations of website users and much more). Documents are the foundation stone of Pub-Me Content Management System. Templates for easy creation of documents (when you create a new menu item or a new article, it is not necessary to deal with the settings – just fill in the name and text and publish the document). have control over displaying of annotations, headings, html formatting etc. Show document tree structure – this type of displaying of documents is suitable if you want to get a clear picture of the entire structure of your website. Show articles in sections – you will use this type of displaying if you want to work with “recent” documents included in sections and do not want to be “bothered” by the entire web structure. Supports automatic sorting of documents in individual “folders” on basis of various criteria. Each document can use a special XHTML template. A so-called alias is provided to each document. It is generated on basis of the document name and makes it possible to use “cool URLs” (e.g. a document called An article about the CMS system which is a child of document About system will get generated alias about-system/an-article-about-the-cms-system). When the name and thus also the alias changes, the system makes sure automatically that consistence and redirecting are preserved and it will take potential duplicities into account and thus will prevent a decrease in the relevancy for search engines. Also a potential collision of folder names, keywords, and documents of the same name are taken into consideration. Articles published on the web can be commmented by visitors. Display all comments or just those related to a specific document. Direct access to comments from the document tree. Complete editing of comments within administration including addition of new comments without having to visit the output website. Optional hierarchical (by threads) or linear output of the comment tree. Automatic or manual approval of comments. Makes it possible to ban a comment without physically deleting it from the website – a warning informing about a violation of the site’s conditions will be displayed instead. Block access to forms (not only those dealing with comments) from specific IP addresses. Documents on the web can be included in sections which can be further grouped. The system supports creation of unlimited number of sections, into which documents (articles) can be added. Sections can be grouped and one section can be in an unlimited number of groups. Sections and their groups make it possible to create special pages with summaries of the most recent articles about specific topics. Documents can be accessed also via automatically generated archives that can be browsed on basis of time of publishing as well as selected sections or groups of sections. The archive of articles can be restricted to the current language version, it is possible to choose the language version manually or display all archived documents regardless their language. A website using Pub-Me CMS supports an unlimited number of language versions. The system supports an unlimited number of language versions including exotic languages not using Latin alphabet. Automated translation of system-generated texts (e.g. Search will be translated to Vyhledávání in the Czech version). The texts can be modified for needs of the specific language version. “Dictionaries” can be extended without any limitations. easy-to-use dictionary files for translation of automatically generated texts. Language versions do not have to have the same structure – it is therefore easy to create for instance the main website in English, then create an additional smaller alternative version in German and add French, Russian and Spanish miniwebsites serving only as business cards with links to the English version. The dictionary files make it possible to use identical XHTML templates to display multi-lingual websites. Administration is made easier to use by a template system supporting special code. Output generation of XHTML code (what the reader sees interpreted by the web browser) uses XHTML templates which use a special CMS code that makes it possible to use automated generation of requested content. They include standard XHTML code (i.e. a normal coder can create them) plus some special instructions on basis of which the web reacts to the system and user’s actions. A real-life example is for instance function menu which generates a menu on basis of the system settings and variables provided to the function. CMS code supports conditions and takes into consideration various cases that an author of the website may need (at the time being more than 70 functions, most of which have rich options of settings). Since there is however no limit of what the author may need in practice, it is possible to extend the CMS code – it is possible to do so by custom functions as well as by add-ins added to the administration. An example of an add-in is for example one called Polls. CMS code takes care not only of generation of output pages themselves, it also takes into consideration exporting of static XHTML or transferring of the website from one server to another. It is possible to manage files on the server in the administration. You can add and delete folders and files using the administration interface. The system supports also direct editing of some types of files in the administration, e.g. XHTML templates. Images (both those that are included directly into documents and those used in galleries). System files (e.g. XHTML templates, custom functions of CMS code, user-defined dictionaries for generated output). Access to these functions depends on admin rights settings and thus it should not happen, for example, that a part-time worker deletes some files for download. The file commander supports functioning also on servers using a so-called safe mode using ftp access. The method that you will use to access files can be defined in the config file. It is possible to export and back up websites. Several data formats are supported. It is possible to back up the database in several formats – you can choose an export to a PHP or SQL file, you can export only the content of the website or structure of database as well, you can compress the output file. It is possible to create static XHTML from the website and use this export for example for generation of a presentation CD. It is possible to define the outpout format (one folder, tree structure of folders), exporting of comments and also restrict output on basis of access rights to individual documents. Not only internal system functions but also the WYSIWYG editor itself takes into account that the website may change its location (either form one server to another or to a presentation CD etc.) – for this purpose the export function takes into consideration not only CMS code functions but the system is able to process also links to images, documents, etc. within individual documents. Thus it will not happen that after moving the website all links to images would lead to your localhost server but they will refer correctly for example to your address www.example.com. Exported back-up files are created so that a transfer or restoration of the website would be a matter of a few clicks – the PHP file can be easily run on the new server, the SQL file can be easily imported for example via phpmyadmin etc. Photogalleries are an integral part of the basic installation. Unlimited number of photo galleries. Galleries can be easily attached to documents in a form of an appendix. A possibility of adding descriptions to photographs including the author’s name etc. A possibility of addition of galleries into groups (one gallery can be added into an unlimited number of groups) – the system then takes care of generation of pages with thumbnails, as well as of displaying of individual pictures fully automatically. Optional type of formatting of gallery output (by css or tables). Up to three sizes of images (preview, website version and original size). Support of LightBox function including large galleries, thumbnails of which do not fit into one page. Generation of galleries from directories (it is not necessary to add pictures one by one). Support of automatic generation of thumbnails and website versions of pictures by the system. Built-in file commander – a possibility of uploading images to the server directly from the administration. All website settings can be changed in the administration. 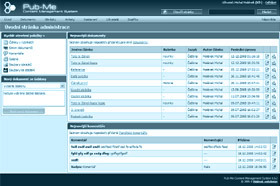 Support for SEO information including “cool addresses” using mod_rewrite, key words, and web description (which can be set independently for each language version), the system takes care also of consistence potentially duplicate addresses (which could occur especially if an address of a document changes). Fully configurable 404 error page (page not found). Setting of special pages such as registration form, site map, RSS aggregates, searching etc. You have full control of these pages. Set up user registration – you can select confirmation e-mail, automatic registration or registration requiring approval of an administrator. The “welcome e-mail” text can be modified to your liking. Set up comments and forms – enable/diable comments, change the output format, anti-spam protection etc. Set up behavior of galleries – turn on/off automatic creation of different image sizes, LightBox, default gallery values. Set up the maximum file size allowed for an upload by the administration. Choose the method of access (prescription) to paid-for documents. Set up behavior of comments that send e-mails. An unlmited number of administrators with different rights can administer the web. Support for more administrators of the web. 6 levels of admin rights (“Junior editor” through “God”) which define access to various parts of the system – e.g. access to locked documents, possibility of publishing of documents on the web, access to file commander etc. You can set “superior” administrator who has a right to work with data of their subordinates. Deactivate administrators without deleting them from the database. Individual settings of administration interface – especially options of language and preferred editor (XHTML, WYSIWYG) selection. Readers can regsiter and get access to special parts of the website. Support of registered users (readers of the web) at several levels (unregistered through VIP user). Access to documents on basis of user level. Support for several methods of user registration – automatic, via a confirmation e-mail with an activation code, or manual confirmation by an administrator. Delete users without deleting them from the database. Information about prescription to paid documents (articles). Modify the registration form fully to your liking and needs of a specific website.